Home » Music » MJE Memorial Lib » The Michael J. Epstein Memorial Library’s “Custom Songs for each Speaker” to be presented in TEDx Innovations session in Doha, Qatar! The Michael J. Epstein Memorial Library‘s TEDxSomerville involvement was presented by C. Todd Lombardo, executive director of TEDxSomerville, at the TEDxSummit 2012 in the Innovations session. His “Custom Songs for each Speaker” presentation will be heard by an international audience in Doha, Qatar and will feature the story of MJEML’s creation of songs for TEDxSomerville 2012! We had recently already expressed our excitement from serving as the house band for TEDxSomerville (story on the TEDxSomerville blog)! Our participation involved writing a song about each of the 25 speakers. It was challenging to complete, but we had a lot of fun doing it and treated the songs as ad hoc pieces that we’d leave behind after the event. To our delight, many of the speakers and other attendees immediately started expressing interest in hearing recordings of the songs. Because many speakers missed their songs or weren’t able to catch the details in the excitement, we immediately posted some recordings of our rehearsals, intended to help us learn and review the songs for our performance, along with lyrics so that interested parties could get the details. That didn’t seem to be enough. The requests poured in for more complete and polished recordings of the songs. At first, we were reluctant to spend time making this happen, but as the days after the event rolled by, we realized that we really enjoyed working with the songs for both their musical content and the context under which they were created. It was a bonding and learning experience for the band and it helped root us in the Somerville and surrounding community – something we’ve been extremely proud to be a part of for a long while (often playing City events such as ArtBeat and the Farmers Market). Thus, we present to you a living, breathing version of the speaker songs from TEDxSomerville 2012. This page will include all of the recordings that we have completed – eventually leading up to the release of the full collection sometime this Summer. (Some of these mixes may also be tweaked along the way prior to the final release, but they are close to final mixes.) We look forward to periodically adding songs here and we plan to write a post about each of the songs, telling how the song developed and tying the song to the context of the speaker’s presentation at TEDx. 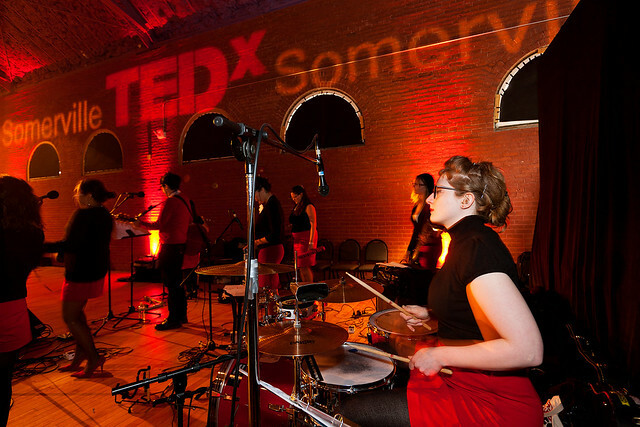 TEDxSomerville music curator Jon Bernhardt asked me in December if we’d hypothetically be interested in serving as a house band for the event, which would potentially include playing some music referencing speakers or writing an event theme song. It sounded like a lot of fun. We’ve always been a band that has sought to take on adventurous projects that step outside the typical scope of an indie/folk/rock band. The challenges make creating music exciting. Last year, for example, we worked with BalletRox to create a 12-minute piece of music for a choreographed modern ballet that we then performed live with the dancers at the Strand Theater. Earlier this year, rather than learning covers of movie theme songs for a film-music-themed salon night, we developed, shot, and edited a 24-minute silent film based around our songs in less than a week. So, when we were offered the challenge of creating some unique music for TEDx, we knew that although it required a very rapidly created body of work, it would be a fun project to take on. We were quite busy in the beginning of the year (making our film and wrapping up recording for another project) and I was on tour until February 23rd. On Saturday February 25th, we all set aside 6-hour block of time for songwriting. One great thing about the MJEML is that we have three members who are very experienced at songwriting and numerous others who have at least some experience with the process. So, we split into three groups and allocated songs by session to each of the groups. Two hours later, each of the groups came back with as many of their assigned songs as possible developed as far as they could be taken in that short time. We then spent a few more hours going over the songs, revising the structures, and developing individual parts for each member of the band to play. This is fairly typical of our band’s approach to songs. The songwriters did some homework over the next few days to finish the six or seven songs that really hadn’t been completed in the group session. We had long rehearsals on the following Wednesday, Friday, and Saturday before heading to the tech rehearsal on Saturday night. I would have loved about 50 more rehearsals, but we figured that even if we weren’t great at performing the songs, the spirit and ideas were at least there, and we hoped that would be sufficient for entertainment value. In terms of strategies for writing and learning, we all agreed to keep the songs as simple as possible. The rules were: not too many sections, lots of repetition, and relatively simple chromatic melodies within the typical scope of the chord progressions. Some of the songs really stuck closely to genre conventions (Lenni Armstrong’s ‘50s style 6/8 tune for example). Others veered into weirder territory – our free jazz jam for Alex Feldman. We attempted to cull as much information and value as we could from the bios and abstracts that we saw. For some speakers, we had only talk titles. We investigated the speakers on the web and found interesting nods to include (For example, while we had scant information about his talk, Clarence Smith, Jr.’s website is http://doyouknowclarence.com/ and “Do you know Clarence?” became the primary repeated phrase for his song). The more we felt free to explore our own fantasies about the speakers, the more fun we had perhaps. We knew (or at least had met) a few of the speakers already and felt more comfortable giving them stranger songs, referencing their unrelated lives, or stretching the realities a little bit. Examples: Ross Lohr (we referenced him leaving his band, Aloud, and heading off to Tanzania), Brian Whitman (we felt like he would have a good sense of humor about our “fantasy” that his music-processing “robots” would someday rise up and take over the world), and Mayor Curtatone and his famous public mockery of Cambridge. Admittedly, we actually were nervous about the Mayor’s song and its implicit criticism of Cambridge because we didn’t want to present something at a community-building event with such a negative spin. Our fears subsided a little when Mayor Joe took the stage and spent his minutes saying things like “our freaks are better than their freaks” referring to Somerville’s artistic superiority over Cambridge. On the day of TEDx, we were pretty nervous. The staff at the Armory did a great job getting us set up for sound within the limits of the situation. We had a lot of technical limitations as we were not on stage and weren’t part of the main sound setup. So, we only had one monitor mix (four is typical for us at most shows), which was challenging for songs that we were not so familiar with. It was a lot of fun to get to perform the songs – some went very well, others less well – and see and hear the reactions of the crowd and particularly the speakers. We got wonderful, kind feedback during and after the event and we were really glad to be able to create and contribute something unique to both this event and to TEDx events in general it would seem. Originally, we had thought of these songs as relatively disposable ad hoc numbers, but in the days after TEDxSomerville, we found ourselves singing them over and over again. The initial plan was to maybe record a few for the people that expressed interest and to help us commemorate the event. As we lived with the songs a little more, we decided it would be fun to record them all. So, we’ve set out to do that and plan to release a full 25-song collection sometime this Summer. Next PostNeutral Uke Hotel / The Michael J. Epstein Memorial Library / Golden Bloom April Tour Recap in pictures!